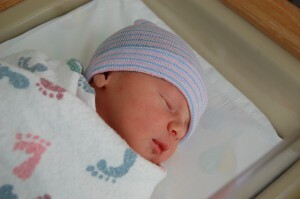 Harper Hawke Backstrom came into this world Wednesday, August 10, 2011, at 21:24. Due September 3, his arrival was accelerated by a torn bag of waters, but we are happy to announce that he is healthy, handsome, and nursing well. Harper was born in the same hospital, in the same room, assisted by the same midwife, though through a much different labor. I am thankful that we were not completely unprepared, and I am thankful for those friends and family who dropped what they were doing to help us in our time of need: Patty C., Donna C., Jenny and Justin T., thank you for letting us focus on the task at hand. Mom and Dad, thank you for being such good caretakers for our firstborn as we wait for our family to be whole again. Thank you to our midwives and nurses, who have taken such good care of us these past few days. Thank you to our friends and family who wished us well and kept us in their thoughts. We look forward to getting to know Harper with you, and seeing the world through his eyes.